Ezhukari Kootu or Thiruvadirai kootu is prepared in Tamil Nadu during the auspicious celebration of Thirvathirai, a festival celebrated in praise of Lord Shiva for creating this universe approximately 130 trillion years ago. This kootu is traditionally served with Thiruvathirai/ Thiruvadirai Kazhi (kali) – a sweet dish made from rice, moong dal and jaggery. Kootu is a specialized stew from Tamil Nadu that incorporates almost any vegetable and includes dal and fresh kootu powder. 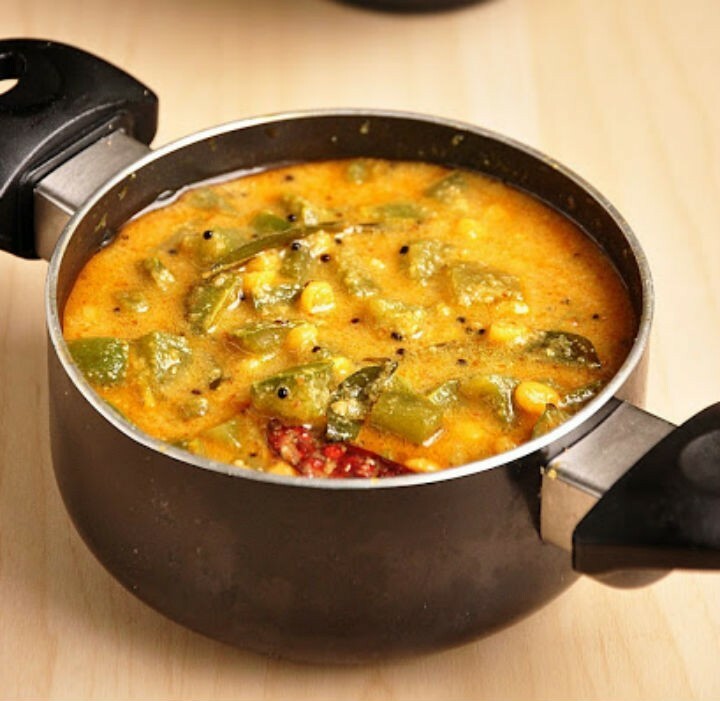 The Ezhukari Kootu is a fine way to include the goodness of multiple vegetables into our diet. While the kootu is rich in itself, a dollop of ghee is never far behind and enhances it taste. In many ways, the art of cooking is therapeutic in itself. Kootu is one such heavenly dish with subtly being its middle name. Subtle spices, mild aroma of the spices and a hint of coconut, all enhanced with a dollop of ghee when served. The Ezhukari kootu is best served with hot pongal, plain rice or Thiruvathirai Kali. You can even have it with chapati, roti or parotta. The pairing is endless. Whichever option you choose, don’t forget to top it with Ghee. Pressure cook the toor dhal with little turmeric powder & mochai for 3 to 4 whistles. Set this aside. Clean and cut the vegetables into cubes. Add a few drops of oil and roast the ingredients under “Roast & Grind”. Remove after 1-2 minutes & set aside. Let it cool down and grind them to a fine paste using a little water. In the mean time, par boil the vegetables until soft and keep it aside. Heat a kadai with the remaining oil and temper with mustard seeds, curry leaves, red chilli, asafoetida and fenugreek seeds. Add the par boiled vegetables along with salt. Add the tamarind water and cook until raw smell disappears. Add the cooked dhal, mochai and ground paste. Mix well. Add 1/2 cup of water and stir well. Cook for 10 minutes under low flame. Ensure that dhal does not stick to the bottom of the pan. Cook until the consistency is neither too thick nor watery. This tasty and healthy gravy can be served with Thiruvathirai kali. Feel free to comment or share your thoughts on this Ezhukari Kootu Recipe from Awesome Cuisine.